As soon as one playbook looks to be falling apart, the Left is drafting a new one—and it speaks to their unhinged disposition regarding this Supreme Court nomination. Judge Brett Kavanaugh was already facing a solid Democratic opposition. The two days of frenetic and drawn out hearings showcased a party who knew deep down that the game was up. The GOP had the votes—they still do—and his nomination would sail through. They tried the transparency pivot, asking for time to review scores of documents from his time as the White House Staff Secretary under Bush. None of those documents were relevant concerning his judicial acumen or legal theory. It was a delay tactic, the first salvo of many. Senate Judiciary Chair Chuck Grassley (R-IA) refused his Democratic colleagues’ BS demands because he knew there was nothing that would change their minds; they already gave away the ball game when they announced they would oppose him. Why entertain the motion? So, onward we went. Let’s recap where this nomination hit a snag: The committee vote was slated for today, but Sen. Dianne Feinstein (D-CA) decided to drop a bombshell: a woman named Christine Blasey Ford, alleges that a drunken Kavanaugh, then-aged 17, tried to sexually assault her at a party. This dropped at zero hour. DiFi had the letter since July, never told her colleagues about it, and apparently didn’t think much of it since it was never brought up during the hearings. Maybe it’s because the allegation has no evidence, no solid witnesses, and it’s over 30 years old. Ford can’t remember how she got to the party, how the party itself came together, and who owned the house where this attempted assault reportedly took place. Kavanaugh has denied the allegation. She claims she wanted anonymity. So, why did she hire a lawyer, Debra Katz, and anti-Trump democratic operative? Why did she have a polygraph administered by an unknown former FBI agent? These aren’t actions taken by a woman who wanted to remain quiet and cloaked in darkness. This has all the makings of a character assassination ploy. Progressives have torched Feinstein, however, for sitting on this letter that has plunged the whole process into chaos. Sen. Jeff Flake (R-AZ) a key vote on judiciary said that the initial committee vote should be postponed when these allegations dropped. He also said if Ford is a no-show at Monday’s hearing he will support the motion to move Kavanaugh’s nomination forward. Ford responded today, saying she would testify, but not on Monday. The Judiciary Committee has been very cooperative, offering Ford private, public, and even an interview at her house taken by staffers to get her story on record. The Constitution does provide that federal judges, including Supreme Court justices, “shall hold their Offices during good Behavior.” The settled understanding of this phrase is that so-called Article III judges enjoy lifetime tenure. But the Constitution also makes both judicial and executive officers subject to impeachment. And, as it happens, the House of Representatives holds “the sole Power of Impeachment.” If the Democrats win back the House in November, they can exercise that power. If a simple majority of the House decided to proceed with impeachment, the House Judiciary Committee would be empowered to conduct a thorough and careful investigation of the sexual misconduct allegations that Professor Christine Blasey Ford has made against Mr. Kavanaugh involving a drunken sexual assault when both were high school students in suburban Washington, D.C.
Of course, even if the House impeached Mr. Kavanaugh, it would still take a two-thirds majority in the Senate to convict and remove him from the Court. But the Senate vote would surely have at least something to do with the merits of the House’s case: If a full and fair investigation shows that Mr. Kavanaugh has lied regarding the incident — he has denied it categorically and says nothing even remotely like it ever occurred — Republican senators may find it hard to vote “no” in the #metoo era. It would be a terrible blow to the legitimacy of the Supreme Court, of course, but this is the risk that Senators McConnell and Grassley seem willing to take. 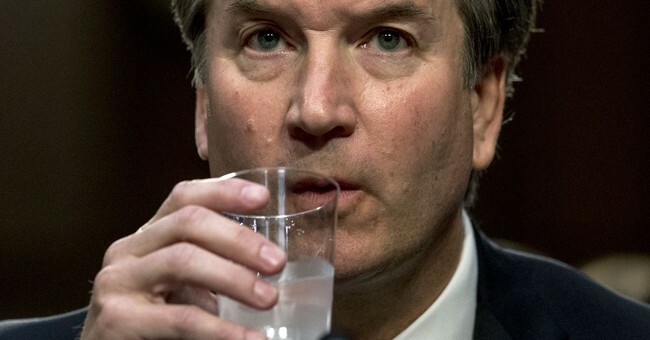 Moreover, an impeachment investigation could also encompass allegations that Mr. Kavanaugh has committed perjury before the Senate, twice, related to his work on the nomination of District Judge Charles Pickering to be a judge on the Court of Appeals for the Fifth Circuit. Under oath, both in 2006 and in 2018, he said he had no involvement with the White House strategy sessions associated with Judge Pickering’s nominations. Subsequently released emails, involving these sessions, suggest that these answers were at best misleading and at worst totally false. Attending a strategy session as a White House staffer is not a crime. Lying under oath to the Senate Judiciary Committee, on the other hand, is. Perjury would be a perfectly justifiable, and constitutional, basis for impeachment. Sen. Sheldon Whitehouse (D-R.I.) said that “as soon as Democrats get gavels,” the party will vet the FBI’s handling of Ford’s claim against the Supreme Court nominee — even if Kavanaugh is already seated on the high court by that time. Rep. Eric Swallwell (D-Calif.), who sits on the House Judiciary Committee, also said in an interview that the party could probe Kavanaugh’s denials of the allegations against him. "If they ramrod this nomination through, and we win the majority, we can still investigate this on the House side, and certainly the question as to whether a Supreme Court justice committed perjury is something you could look at,” Swalwell said in an interview. "Hopefully it doesn’t come to that; hopefully they do this right." Their comments point to a continued Democratic focus on Kavanaugh that could help turn out liberal voters in November, regardless of whether the GOP can confirm him. They really hate this guy. I mean, really hate him. We said it would get nasty. Abortion, liberal America’s favorite pastime, is under threat. They also see a 5-4 solid conservative majority for the next generation as something beyond intolerable, maybe even apocalyptic. For conservatives, that 5-4 solid majority is worth fighting for—and it is. It’s a street fight. It’s not a time to be nice to one another. It’s a time to break out the biggest guns you have to fight against these possibly false charges against Kavanaugh. It’s wartime, Republicans. Act like it.